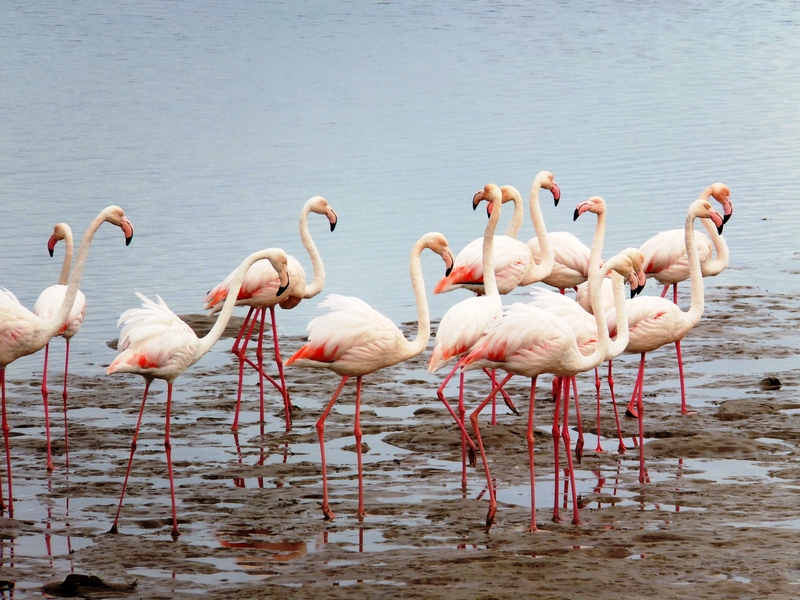 The Kom of Kommetjie (Afrikaans for “small basin”) has relatively recently become home to a small offshoot flock of greater flamingos (Phoenicopterus roseus), the larger flock mining the sediments of the tidal lagoon on Noordhoek Beach. 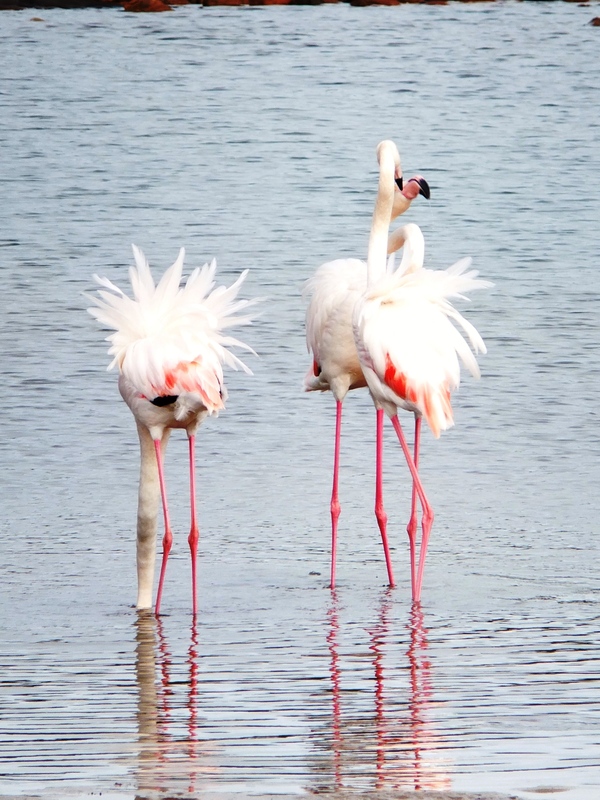 This species, along with the lesser flamingo (Phoenicopterus minor), is a common resident distributed across the coastal lagoons and pans of southern Africa. Feeding flamingos in the muddy sediments at the Kom. The genus, Phoenicopterus, to which this species belongs is derived from the Greek word “phoinikopteros”, which literally translates to “red-feathered”. 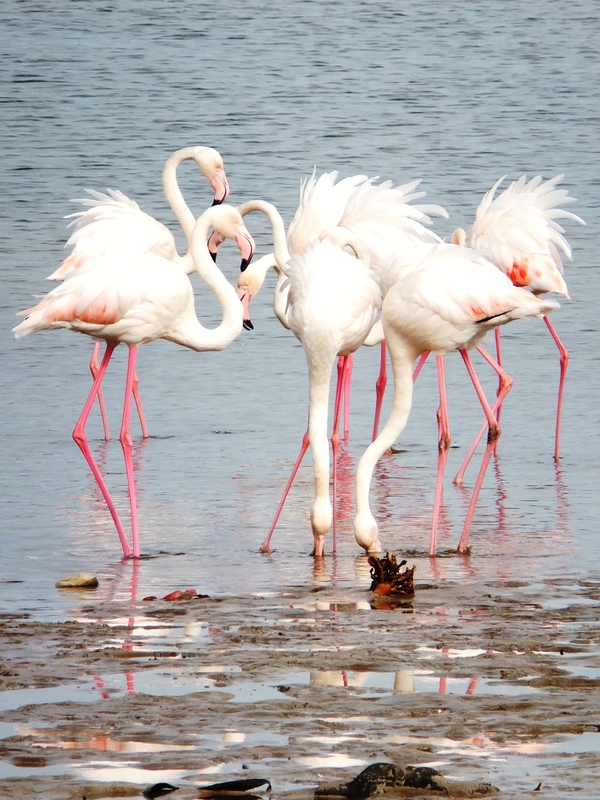 The colour of these birds originates from the carotenoids present in their diet, crustaceans and molluscs for the greater flamingo and blue-green algae and diatoms for the lesser flamingo. As the intensity of their pink/red colouring is influenced by their food source, it is therefore species dependent. 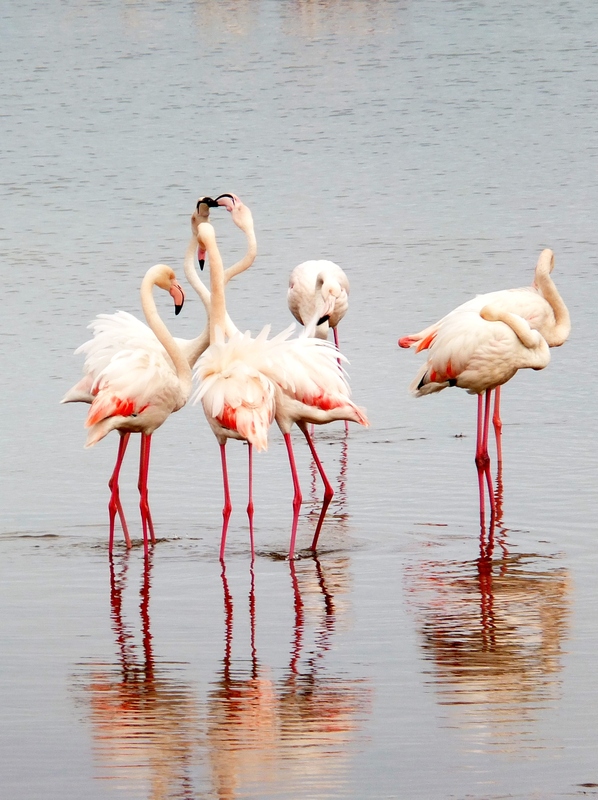 Carotenoids are organic pigments that are found in photosynthetic organisms resulting in the lesser flamingos presenting a plumage of a much richer red when compared to the greater flamingos, which feed off animal species and therefore receive their carotenoids “second hand”. Sexual dimorphism is present in this species but unreliable in the field. Males are slightly larger with a longer wingspan than females. 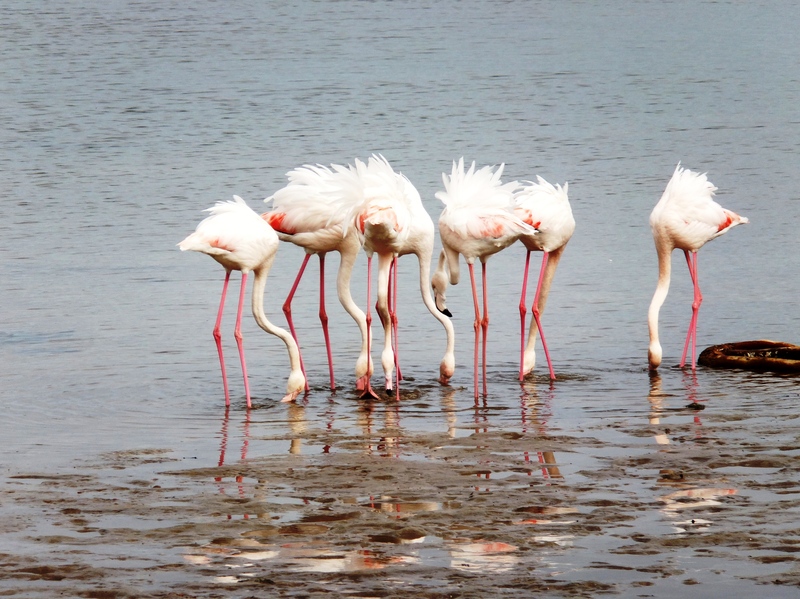 The greater flamingo feeds by filtering the bottom sediments while the lesser species strains the surface waters for free-floating organisms. 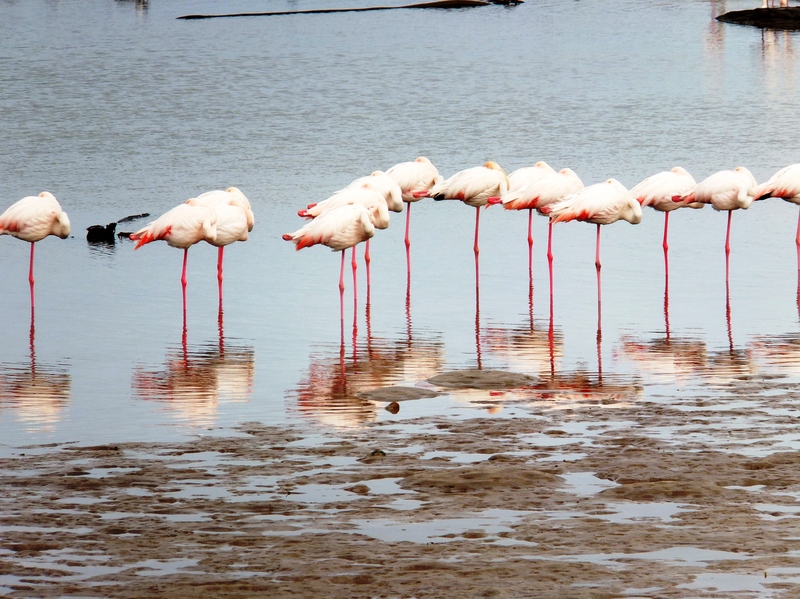 Stamping their feet while turning in a tight circle is a common sight in a flock of feeding greater flamingos. This aids in disturbing the sediment and the creatures within it. 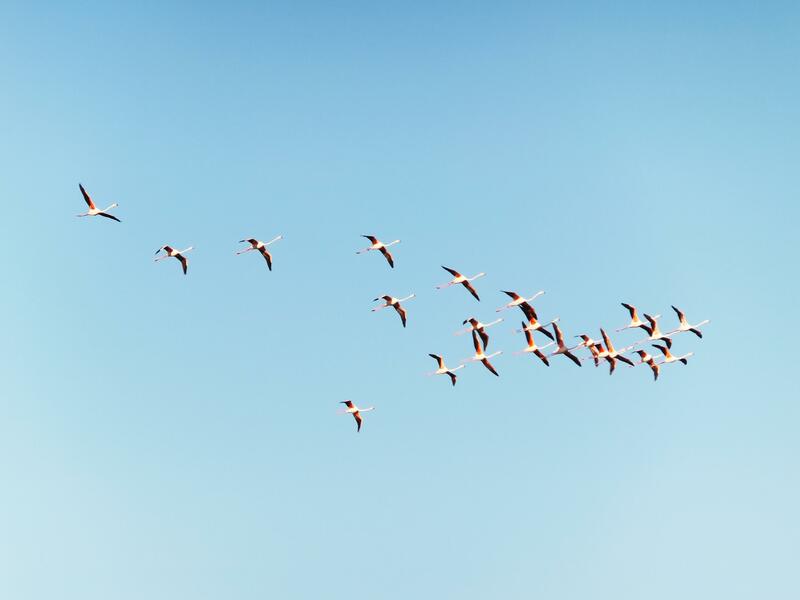 This small flamboyance of flamingos has been regularly visiting the Kom for the past few years, their ungainly yet elegant flight being a common sight overhead in the early mornings and late afternoons as they make their way to and from the Noordhoek Beach lagoon. Daily migration between feeding grounds. The Kom is an ideal feeding ground for these birds as it provides a foraging habitat that is regularly flushed by the incoming tide but sheltered from the heavy swell that often sweeps up the west coast. Centuries ago, before this little tidal basin was home to the walking contradiction of a loudly squawking yet graceful flock of flouncing flamingos, the Kom provided the Strandlopers with a protected environment in which to trap fish and later in the early 1900’s it supported a small community of trek fishermen. 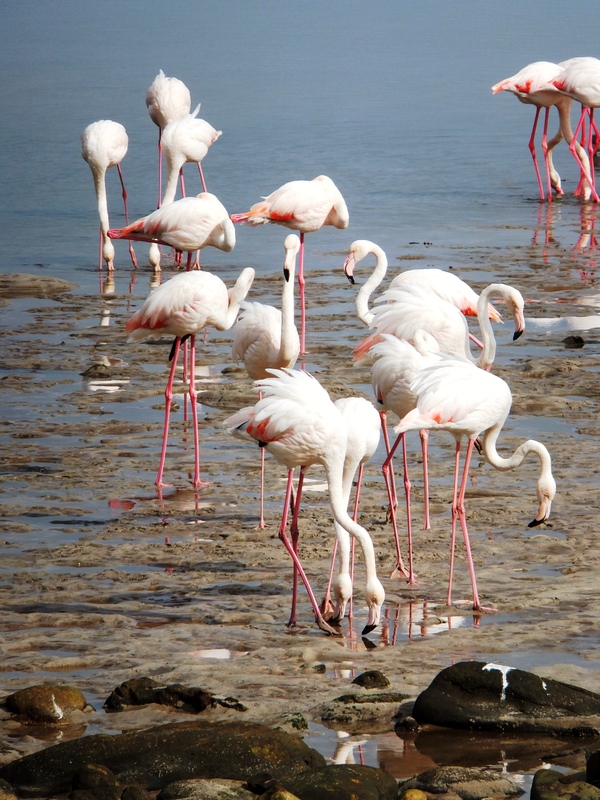 Low tide exposes the sediment to foraging flamingos. The sheltered nature of the Kom allows for naps between meals! They are such fascinating birds to photograph. Besides their enchanting appearance, the stark contrast of their colourful plumage reflecting in the dark, gun-metal-grey waters of the Kom is enough to keep me snapping away every time I see them. They really are a rambunctious crowd… constantly chattering while they feed. They remind me of a Tina Turner type diva in their feathered skirts! 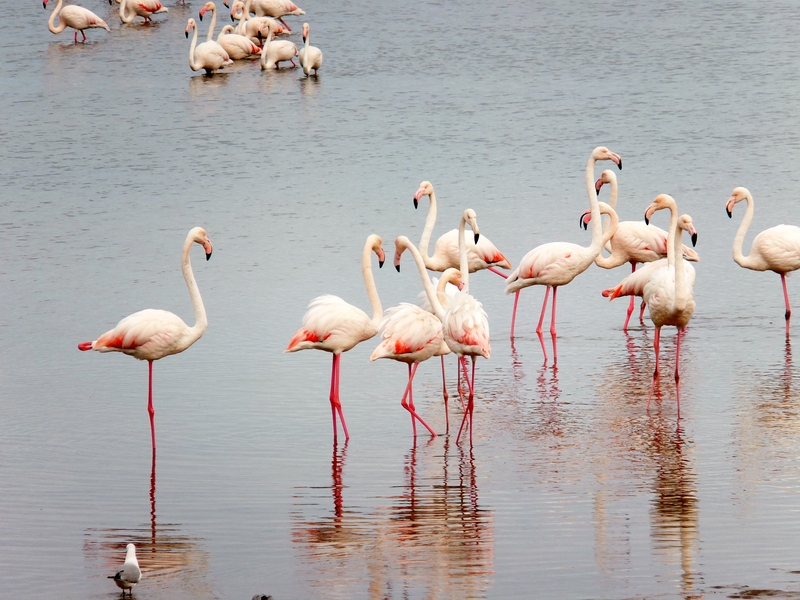 The flamingos share the Kom with a number of other bird species. Bird Island, adjacent to the basin, is an important SANParks protected breeding site. Branch GM, Griffiths CL, Branch ML & Beckley LE. 2010. Two Oceans: A Guide to the Marine Life of Southern Africa. Cape Town: Struik Nature. Friends of the Kommetjie Library. 2002. A Century of Kommetjie. Fish Hoek: Fish Hoek Printing and Publishing. Hill GE, Montgomerie R, Inouye CY & Dale J. 1994. Influence of Dietary Carotenoids on Plasma and Plumage Colour in the House Finch: Intra- and Intersexual Variation. Functional Ecology. 8(3): 343–350. Kear J & Duplaix-Hall N. 2013. 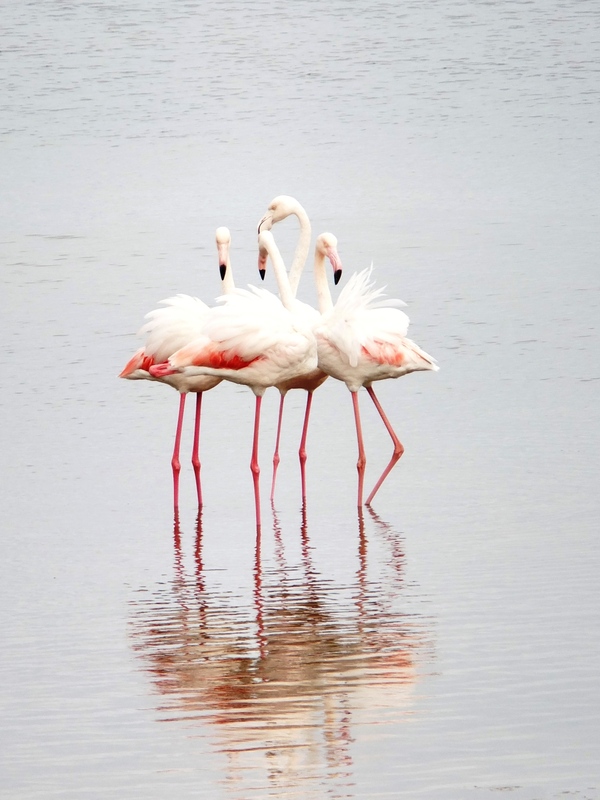 Flamingos – Poyser Monographs. London: A & C Black. Well done Sal. Great photies and an interesting read for the uninformed (like me) ! !